Yesterday was a day of Thankfulness. Surrounded by the people I love, we spent as much time together as we could and relished every moment. We went out to lunch then drove to the top of Morrow Mountain. Next year, if the weather is this nice, we’ll have a picnic on the mountain. It has such a lovely view. All of need to BE in that surrounding more often. Our son, Don, came home for the day. Ahhhh, the pitter patter of size 12s around the house once again was music to my ears. Yes I remember how to cook for a growing boy. I say growing, he’s an adult but he’ll always be my baby. Just like I was always my mother’s baby. At 88, Mother passed away on October 10th so this was our first Thanksgiving without her. She was dearly missed. I made it through the say without crying but did tear up on the way home from our day out. I’ll always miss her because the hole in my heart will always be there. But I’m thankful for the years we had together, for the life lessons she taught me, for the love we shared, and for her grace. We’re thankful for Bob’s mother, Essie. At 94 she’s a pistol who is on less medication than we are. Except for her hearing loss, you’d think she was in her sixty’s the way she skips around. We’re thankful that she still lives independently, plays Bridge as often as possible, reads a novel a week, attends various festivals with me, and is my wine drinking companion. My beloved husband, Bob, will be home all week. Holiday vacations are busy times and we love it that way. We don’t travel any more because we love our home so much. I say home, it’s a ranch with 30ish goats, 2 horses, 5 cats, 4 dogs, and about 15 chickens. Something always needs repair or re-thinking so our holiday vacations are full. This Thanksgiving we will have lived here eleven years. We go no further. It’s the place of our dreams and we get great pleasure working on it. Well, most of the time we get great pleasure. It’s physically exhausting work but that’s another reason why we decided on this way of life. In our late sixty’s (me) and early seventy’s (Bob) we’re better physical shape than we were in our forty’s mainly because we move and lift more. Yes, we pick things up then put them down — a lot. This year we’re bring in bees to pollinate our first ever garden. 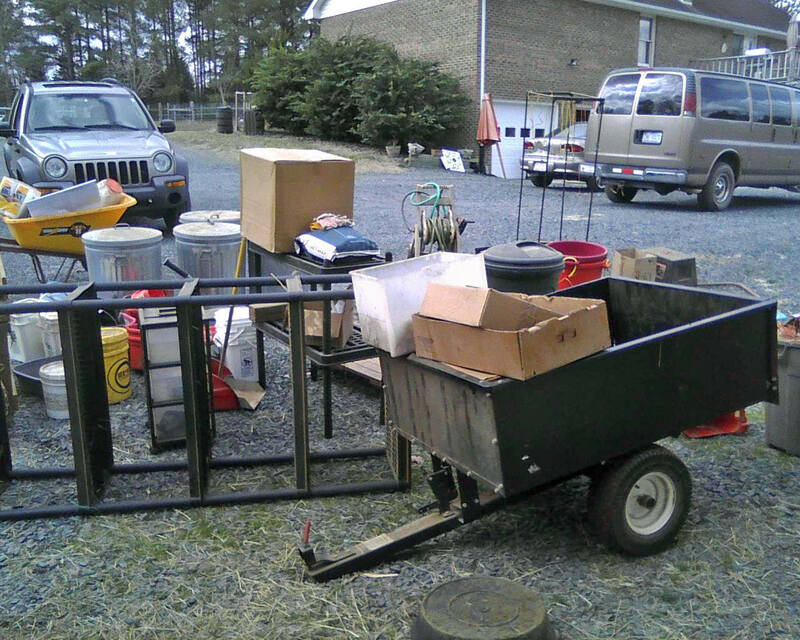 Having been city dwellers for most of our lives we had to learn how to do everything on the farm. 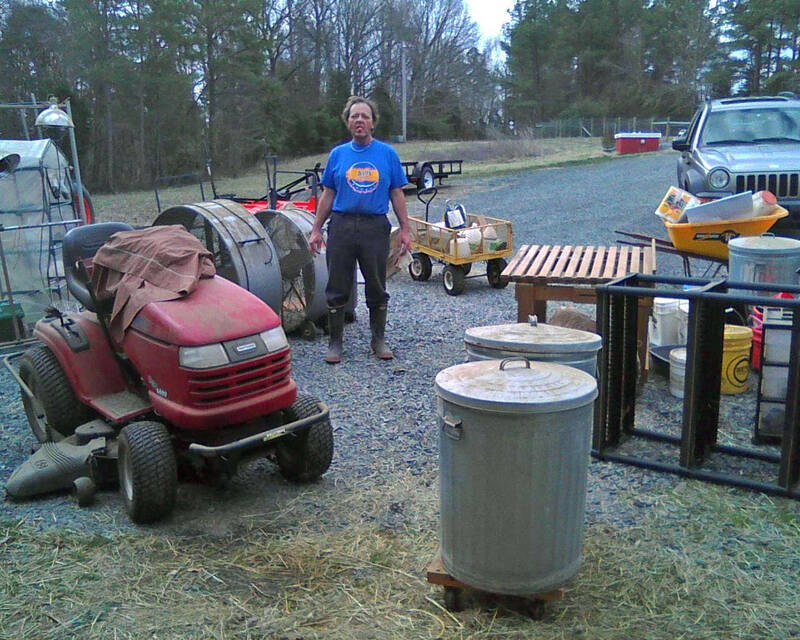 From composting, to tilling, to not tilling, from hauling hot water to the barns because all the water buckets was frozen to setting up heated water buckets. Duh … .Yep, we’ve had to learn it all. Each winter instills another lesson to be corrected come spring. For instance, this year I put the goats on a decoquanate medicated feed in October — before our first freeze. With God’s Grace MAYBE I won’t lose any goats due to any parasite infestation. Everyone has been dewormed and is monitored daily for diarrhea or a rough coat; and, supplements are in the barn cabinet standing by. I’m thankful for my business because it affords me the lifestyle of my dreams. I’ve always wanted to work from home. Don’t know why but I’ve wanted to have everything I do to be of value. Back when I practiced Interior Design I worked from home. That was fun. Now I’m a ranch manager and soap maker. Neither have anything to do with my college degrees except for my ability to teach myself almost anything. THAT’s what I learned from my graduate work and allllll those college hours. I’m thankful for everyone who as used my products. If you’ve never made anything before take a moment to imagine how it would feel to have a complete stranger be intrigued enough in something you created with your own intellect and made with your own hands to buy it for themselves or, better still, to give to one of their friends as a gift. What an honor that is. I am humbled by my customers and work to give them products that will enrich their lives. That’s why I make goat milk bath and beauty products. Because I love the quality and value that goat milk offers.From drinking it to cooking with it, to making cheeses and skincare products, goat milk’s magic comes from the love and care given the goats themselves. Our goats are incredible creatures and deserve the greenest of grasses, the best of all grains, and the utmost of all care. I”m thankful for this lifestyle and cherish every moment. Thank you Mother Father God for all these blessings. Beginning with my Old Fashioned Goat Milk Soap base I added chocolate fragrance oil with swirls of darker soap colored with cocoa. 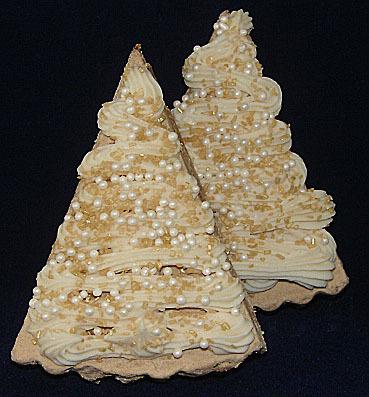 The topping has been piped on top with a pastry bag then sprinkled with pearl-looking sugar sprinkles. 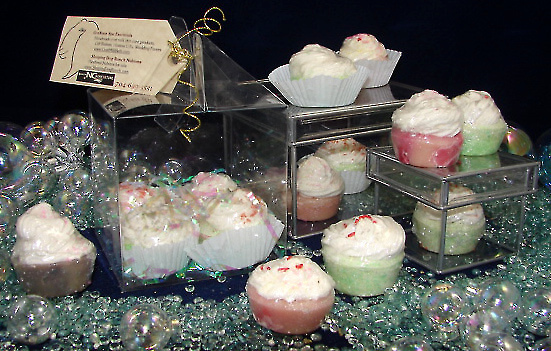 Please do not eat the sprinkles, you won’t like the taste but they dissolve gracefully during your bath. Inhaling the aroma of chocolate isn’t fattening so you can enjoy the chocolate’s essence to your heart’s content. Another way of looking at this soap is by turning it and viewing it as a Christmas tree, chocolate, of course. My MIL (mother-in -law) noticed that. Thanks, Essie. Way to go. Another dream child of mine is Skiddy’s Splash About. Skiddy floats! 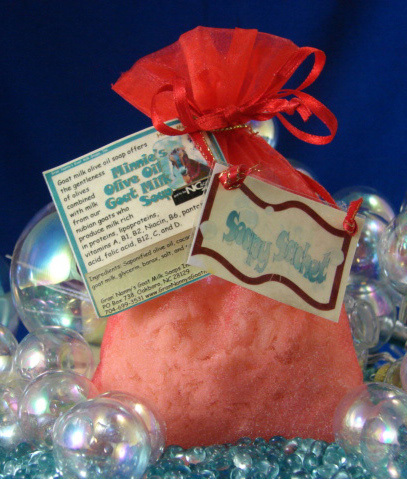 What a fun bath for children of all ages. That is unless they still put soap in their mouth. Not a good idea. This soap begins with my Old Fashioned Goat Milk Soap base with saponified oils of soybean; cottonseed, olive; palm kernel, coconut, and corn; goat milk; shea butter; glycerin and sugar sprinkles. Last weekend I introduced these new products at the Best of Badin Festival in Badin, NC. It’s a good thing I have plenty of rubber duckys because my customers bought almost all of them. I’ll definitely be making more of them this week. I’m still playing/working with my newest molds and forms. These new mini soap cakes are so much fun, I made bazillions of them. I was looking for shapes/molds that would fit in the human hand when these silicone cupcake molds came up in my search field. The pink ones are scented with ylang-ylang essential oil whereas the green ones are contain patchouli essential oil. No wonder pastry chefs are such happy people. I had no idea that pipping would be so much fun. This technique opens a whole new world of designs. I can hardly wait to get back to the factory. Although it’s more like an artist’s studio now. What fun I’m having. My imagination is roaring with excitement thinking about your responses. Like Skiddy’s Splash About, my Best of Badin Festival customers bought quite of few of these mini soap cakes as Christmas presents. What a fun idea. These soaps are not on my websites yet but will be soon. Meanwhile, if you’re interested in them, please let me know so I can hold them back so I won’t take them to the Holiday festivals. Life could give you a pie in the face or you could grab that pie, slice it into smaller pieces, then use it to your advantage. Sure that’s a metaphor but we’ve made it possible for you to have life your way. Take that piece of pie and bathe with it. Rub nature’s richness over your skin as you inhale the aromatic fragrance of chocolate and imagine life on your terms.Savoring a glass of wine while bathing with chocolate soap pie would make the evening so much better. Beginning with my Old Fashion Goat Milk base, I then added Chocolate Fragrance Oil and real cocoa powder for color. 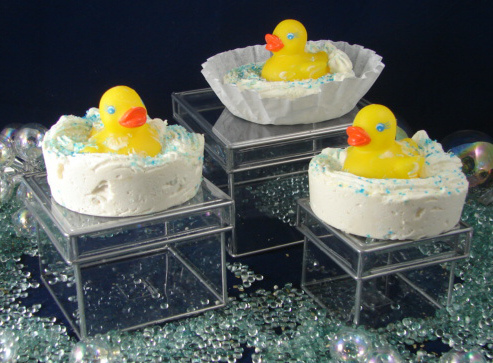 After setting in the new pie mold, this soap pie will sweep you away from your daily exasperation into a bath of bliss. 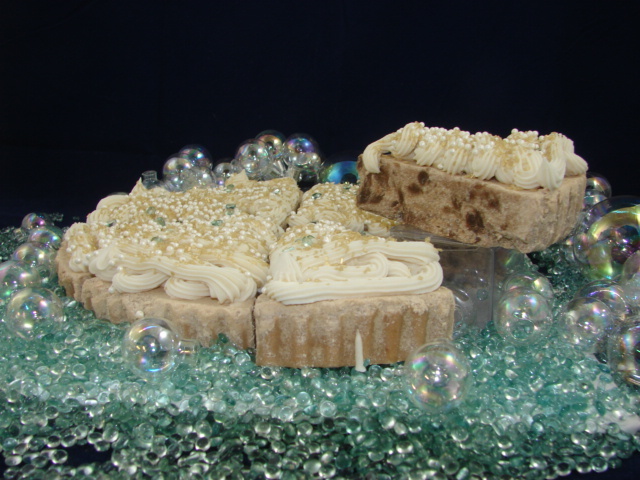 Topped with pipped goat milk soap and sugar pearls and golden sugar flakes (do NOT EAT these decorations), this soap pie looks as luxurious as you’ll feel after soaking in a tepid bath. 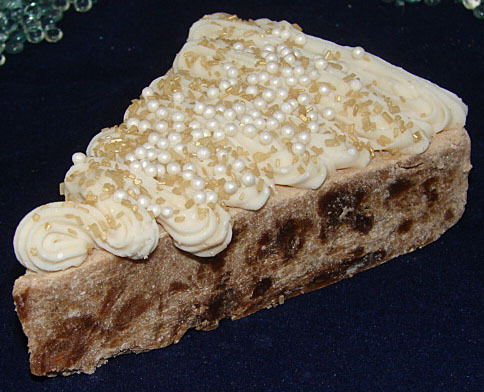 Here is a closeup of my new soap pie. Each piece weighs about 7 ounces.. 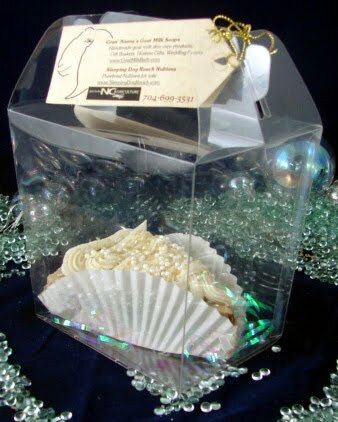 Available with a choice of two packages: (1) Cello bag or (2) clear plastic gable box that is perfect as a gift. Prices will be available soon. Please check back with this blog. Sigh … what a job. I set the standard way too high — again. I exhaust myself sometimes. Not to mention what that standard does to my helpers. But Don is an incredible sport. Guess he’s used to me and my modalities. 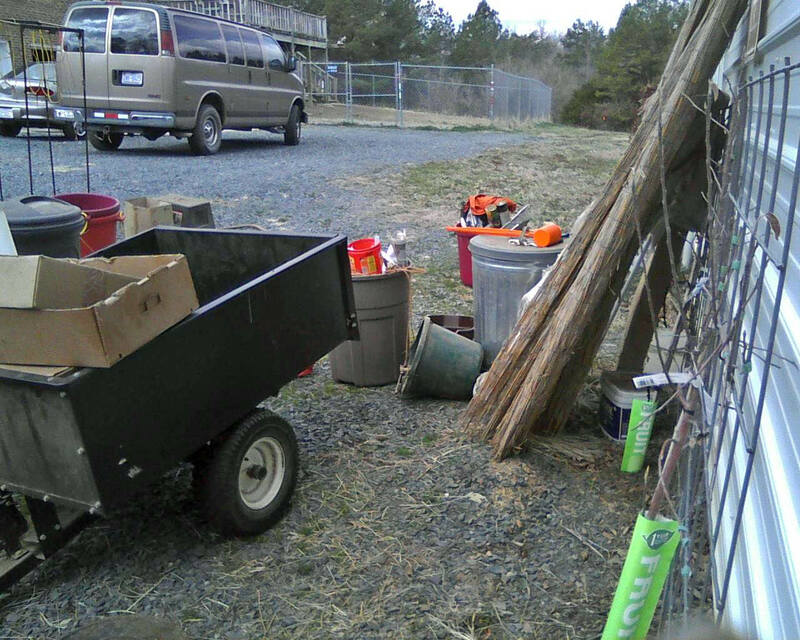 Anyway, MOST of the items have been returned to the barn. But I’m still damp wiping dirt off containers, boxes, and jars. Only then will they be returned to their place in the cabinets. I’m soooooo tired of the dirt. 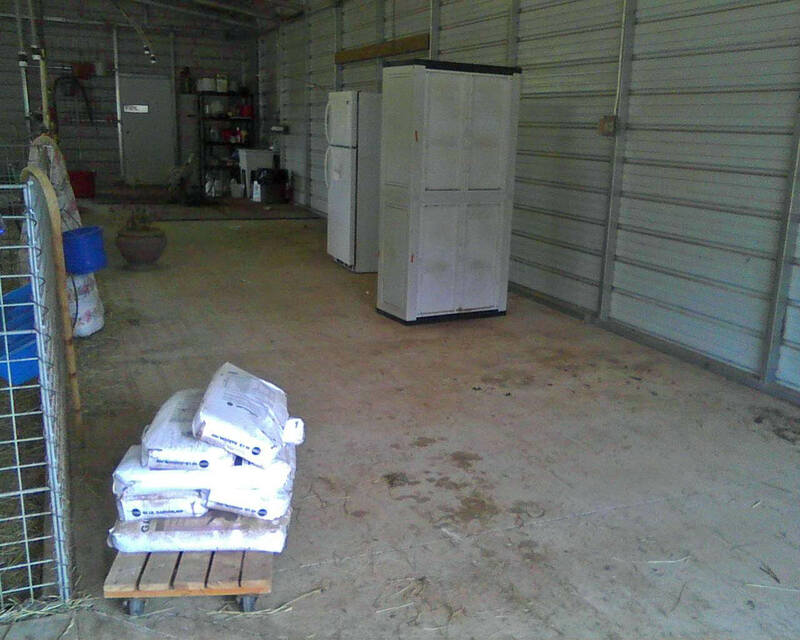 We’ve just got to get rid of the sand in the animal side of the barn. Not sure how or when that’ll happen. I’m still looking for alternative flooring. Following a thorough analysis of my business strengths, I’ve decided to migrate my goat milk bath soaps and beauty lotions web site to this blog. There’s only one of me and I need to consolidate as many activities as possible, especially with birthing season approaching. For your convenience, both sites will be available throughout the migration. That way you can follow these updates and continue ordering my products without any interruption. The http://www.GoatMilkBath.com site links to this blog while the http://www.GranNannysGoatMilkSoaps.com site opens the web. Ahhhhhhh, we’re on yet another journey. Stay tuned … . Don and I put our phones in his car so they wouldn’t get wet. He put a CD in the car player and we worked almost all day. He finished washing the barn while I started cleaning stuff we’d removed. 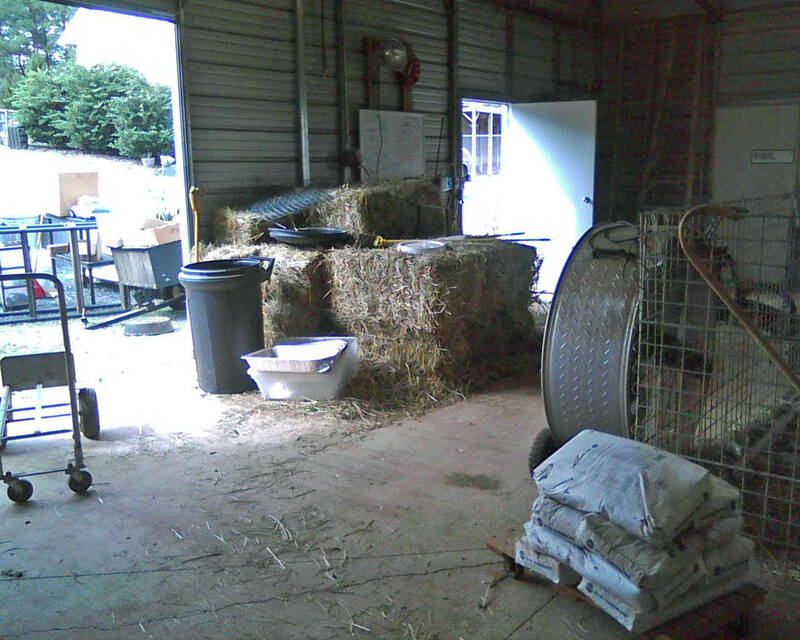 The task at hand is to clean everything BEFORE it goes back into the barn. Yes, that means wiping the dirt off every item and every container. We’ve just GOT to get rid of this sandy floor. Putting sand in the animal side seemed like a good idea at the time but it’s turned into a really big chore. Sure it doesn’t ‘harbor bacteria’ but it’s EVERYWHERE. Will we ever get these lessons learned? Probably not. I guess the real challenge is keeping on keeping on and doing what we love. It’s been long over due but we’re cleaning the big barn. It’s entirely too dirty to house newborns, and out of the question dirty for milking; we need ‘sanitary’ in the milking area. So, for the first time ever, I’m taking time out from making our goat milk soaps so I can get ready for the upcoming delivery and milking seasons. In the past I’ve continued making soaps while maintaining the barns but have found it a bit overwhelming to do it all. his liking the barn as much as we do. But we have muscle to help this season. Our son Don is staying with for a while so naturally his Dad and I are thinking of ways to keep him entertained. 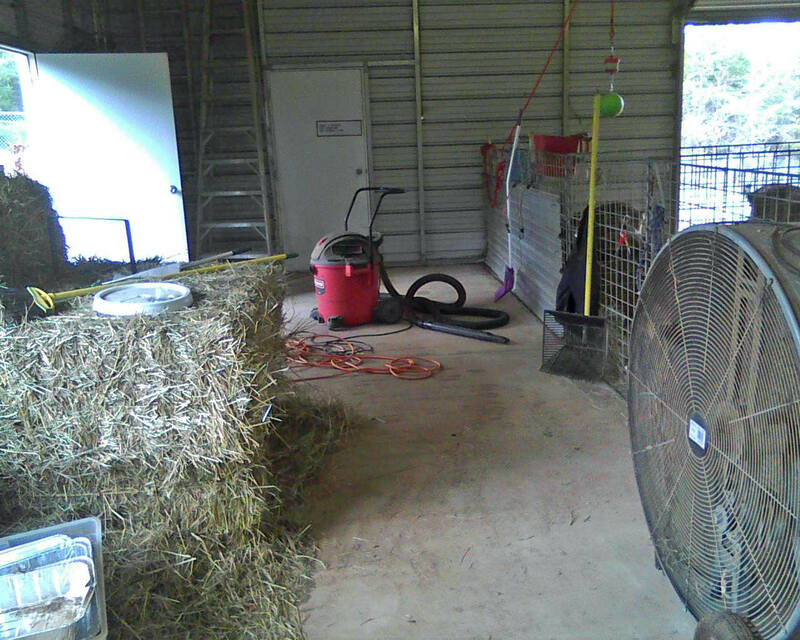 And, since we love hanging out in the barn, we thought he’d like that, too. 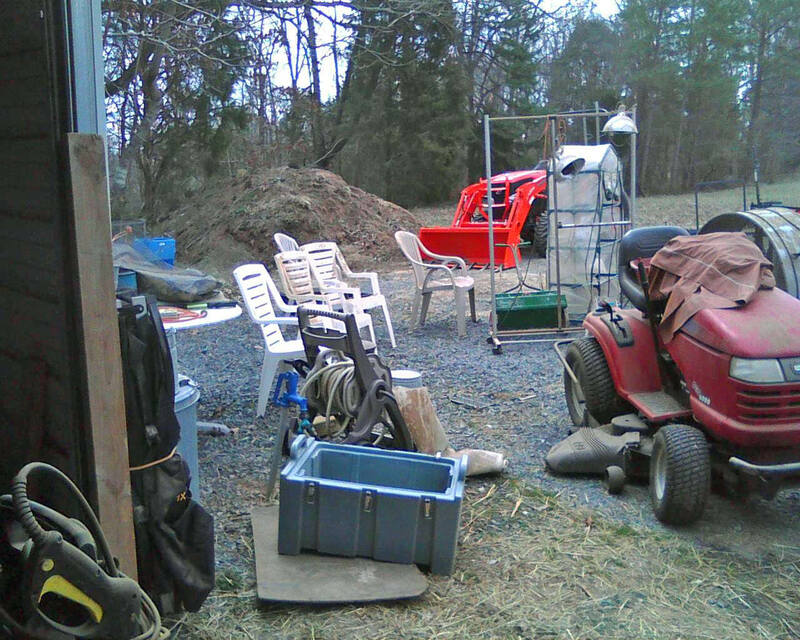 Yesterday, Don and I emptied the human side of the barn. 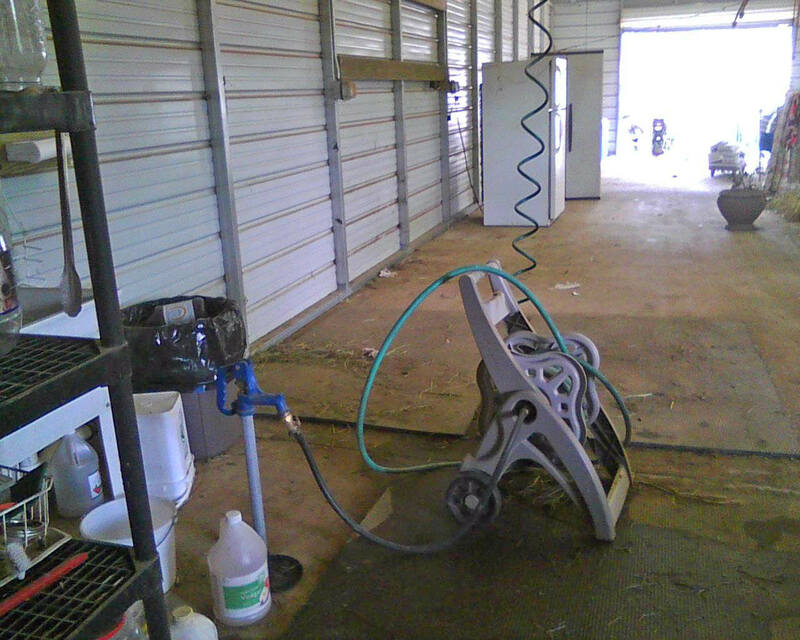 With everything OUT of the barn we began power washing the walls and the most of the equipment. Today we’ll be finishing this task, have everything power cleaned and back in place. front door of more ‘stuff’. of the barn. Gotta throw ‘stuff’ away. the back of the human area. Looking toward the milking area. In milking area looking out the front door. Inside view looking out the front doors. Looking toward the north side. 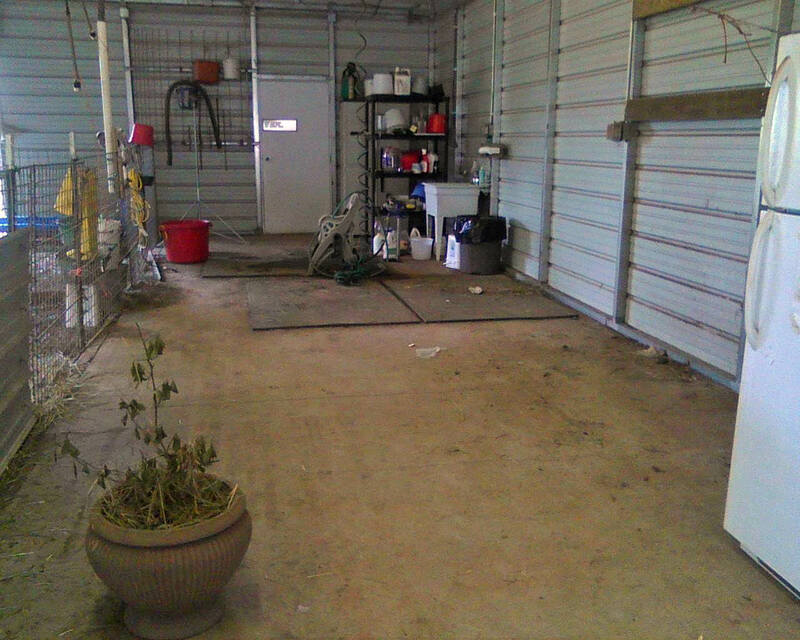 Now all we gotta do is get this CLEAN stuff back in the barn where it goes. I’m working on getting my goat milk soap products on my blog site so they’ll be easier for folks that enjoy goat milk skin care products to learn about my products. 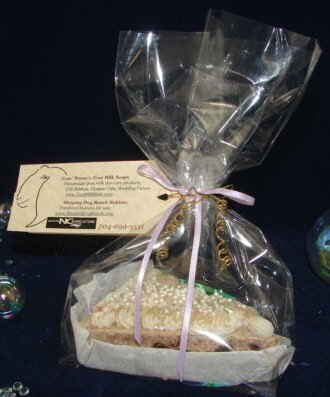 Learn more about my companyon the http://goatmilkbath.blogspot.com/p/about-gran-nannys-goat-milk-soaps.html page. I appreciate your opinions and am looking forward to hearing from you. Boots are lifesavers, especially if they’re barn boots. It’s wonderful being able to walk everywhere and do almost anything around the barn and not worry about something getting inside my shoe. I’m a city girl and it is taking me a looooong time to turn in my shoes. Walking around the house barefoot, wiggling my toes is at will is all I’ve ever known. Guess that’s why the corporate world and I collided. 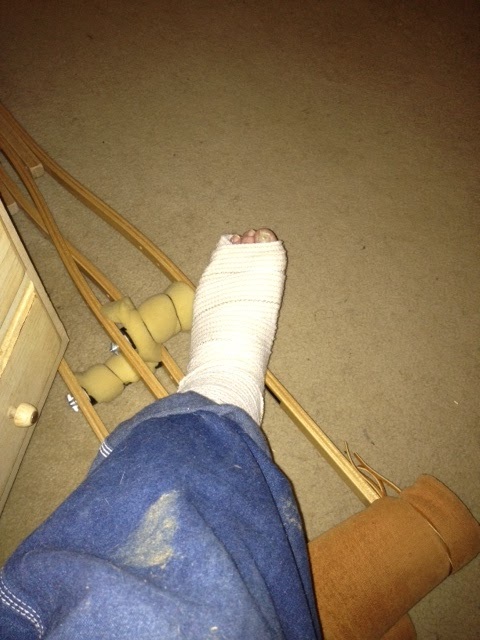 Yes, it was the shoe requirement, as well as other things that bind. When we moved to the country we began with chickens in the front yard, excuse me, front pasture. Did you know that chickens fly out of their pen? Hadn’t counted on that. The banties and the guineas cheat by flying out of their personally decorated chicken abodes. Thank goodness the Orpingtons stay in. Ha, they’re too heavy to fly too high. Although we did have a hen who escaped by flying from one rock to a post to a horizontal post then down to a bird bath, then to the ground. Cleaver lady, that one. As she got older, she learned to crawl under a gate. Zeeze, it’s hard keeping up with all these critters. They are so much smarter. Yup, the little chicken dudes go straight for the front porch in the summer. Guess it’s because they enjoy the warmth of the concrete porch. or maybe it’s the soft mulch, or maybe because more bugs live near the front door than in the chicken coop area. But these little winged angels leave behind gifts of all colors and fragrances. Stepping in chicken poop is worse than stepping on chewing gum. Neither are preferable but the chicken poop is poop. Then again, gum came from someone’s mouth … never mind. I’ll take the poop. At least it’s usefulness can be expanded to the compost. Which, by the way, I have a new respect for. We compost almost everything out here. Mostly coffee grinds, and tea bags, though. The chickens are our little composters. They get our left-too-long-left-overs, egg shells, and too old bread. They’ll also eat the broccoli whereas not everyone in the family will. Sometime I wish we did feed the dogs table food. I hate seeing broccoli being wasted. That’s why it nice having chickens. Even though the goats are picky eaters, most of the time they’ll eat anything from the table. IF I would feed it to them. Not MY goats. They have to have clean, fresh food. However, I have learned that the more you paid for a plant/landscaping, the faster the goats will eat that plant. Then they’ll eat the grass. They are so much smarter. Walking around outside barefooted was never an option. I’m too tender footed; but, inside is my palace. I should be able to walk on anything I want. Right? I thought so. That is until the first day I absentmindedly entered the house in my barn worn shoes. Have you ever yelled at yourself? It isn’t pleasant. From that day forth, we have outside boots and inside shoes. Yup, boots are lifesavers.. Washable boots are pretty good on saving carpets, too. Some types of compost absolutely must stay outside.